After installing the Azure Stack Development Kit (ASDK), you should make a few recommended post-installation configuration changes while logged in as AzureStack\AzureStackAdmin on the ASDK host computer. Azure Stack compatible Azure PowerShell modules are required to work with Azure Stack. You can use API version profiles to specify Azure Stack compatible AzureRM modules. API version profiles provide a way to manage version differences between Azure and Azure Stack. An API version profile is a set of AzureRM PowerShell modules with specific API versions. The AzureRM.Bootstrapper module that is available through the PowerShell Gallery provides PowerShell cmdlets that are required to work with API version profiles. Before installing the required version, make sure that you uninstall any existing Azure PowerShell modules. The Azure Stack module version 1.7.1 is a breaking change. To migrate from Azure Stack 1.6.0 please refer to the migration guide. # Install the AzureRM.Bootstrapper module. Select Yes when prompted to install NuGet. # Install Azure Stack Module Version 1.6.0. # Install Azure Stack Module Version 1.5.0. $Path = "<Path that is used to save the packages>"
$SourceLocation = "<Location on the development kit that contains the PowerShell packages>"
# Change directory to the root directory. # Expand the downloaded files. # Change to the tools directory. Log in as AzureStack\AzureStackAdmin on the ASDK host computer. Open PowerShell as an administrator (not PowerShell ISE). If there was a failure, follow the troubleshooting steps to get help. To make sure that the password for the development kit host doesn't expire before your evaluation period ends, follow these steps after you deploy the ASDK. On the development kit host, open Group Policy Management (GPMC.MMC) and navigate to Group Policy Management – Forest: azurestack.local – Domains – azurestack.local. Right-click Default Domain Policy and click Edit. 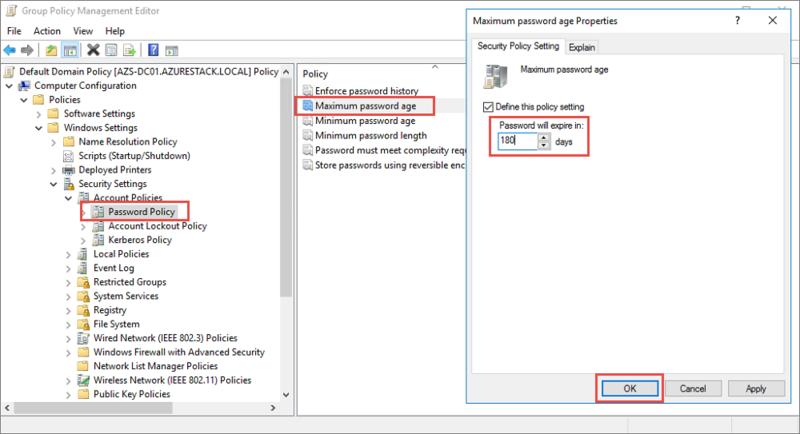 In the Group Policy Management Editor, navigate to Computer Configuration – Policies – Windows Settings – Security Settings – Account Policies – Password Policy. In the right pane, double-click Maximum password age. In the Maximum password age Properties dialog box, change the Password will expire in value to 180, and then click OK.
For deployments using Azure AD, you need to enable multi-tenancy for your ASDK installation. When administrator or user accounts from domains other than the one used to register Azure Stack are used to log in to an Azure Stack portal, the domain name used to register Azure Stack must be appended to the portal url. For example, if Azure Stack has been registered with fabrikam.onmicrosoft.com and the user account logging in is admin@contoso.com, the url to use to log into the user portal would be: https://portal.local.azurestack.external/fabrikam.onmicrosoft.com.